Arcade Monitors now in stock. Replace your old faded monitor with a brand new flat monitor and bring your arcade cabinet back to life. 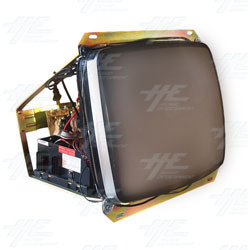 Also suitable for Cocktail cabinets, Mame cabinets or as replacements for industrial monitors. We have sizes and frequency to suit everyones needs, from compact 20" CGA 15K monitors to giant 38" CGA/EGA/VGA (15K/24K/31K). All monitors come with a great range of adjustment options, build into the chassis and a second external set of controls. Our range of monitors can also handle inputs for your standard 15 Pin D-Sub connector (PC connector), allowing your computer to plug straight in. Or as RGB in either separate or combined sync with its adapter board and cable.